Byzantium led by Justinian I is a custom civilization mod by JFD and Janboruta, with contributions from Shadow Pope, Regalman, Urdnot_Scott, and SgtWolf. It requires Brave New World, and works best with Gazebo’s Community Patch. Justinian I does not replace Theodora’s Byzantium. Justinian I’s unique ability is Renovatio Imperii: Barracks, courthouses and temples can be constructed for other cities from the capital. On completion these buildings yield Great General points. The cataphract is the UU for Justinian’s Byzantium; it has +5 strength over the knight it replaces, but has one movement point less, costs 50 shields more to build and +10% production per city under enemy control. It may use defensive terrain and has a smaller penalty against cities (25%). The UB is the hippodrome which consumes one horse resource, but doesn’t require horses or ivory nearby, like the circus it replaces. It generates +15XP for land units and earns gold when a unit is trained (but not bought) in the city, equal to their starting experience. 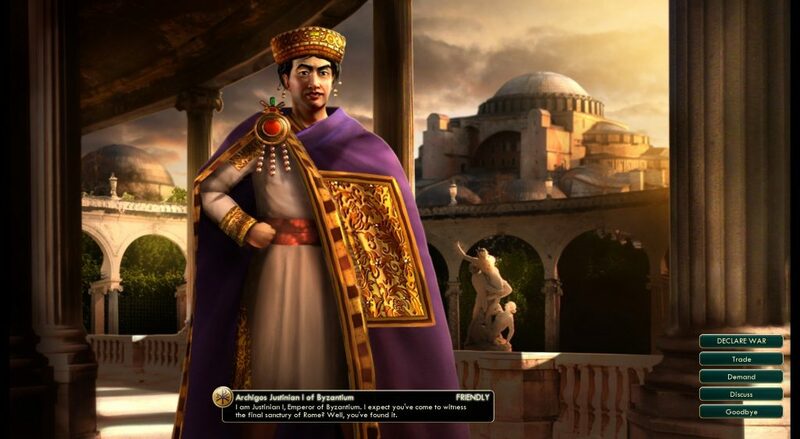 To download and discuss Justinian I’s Byzantium, head over to JFD and Janboruta’s civilizations in the Civilization V Creation and Customisation forum.